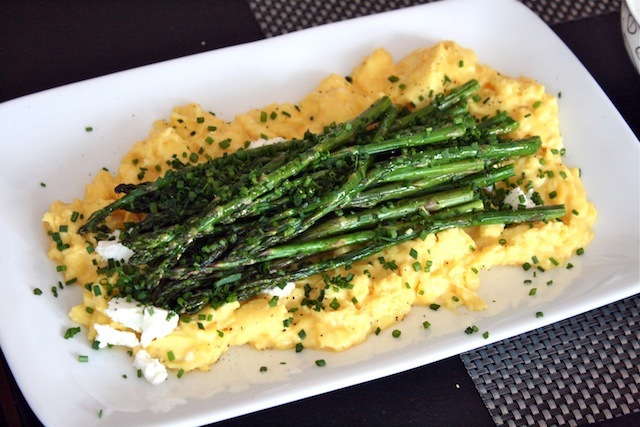 Easy Easter Entertaining: Goat Cheese & Asparagus Scrambled Egg Recipe! / Hey, EEP! 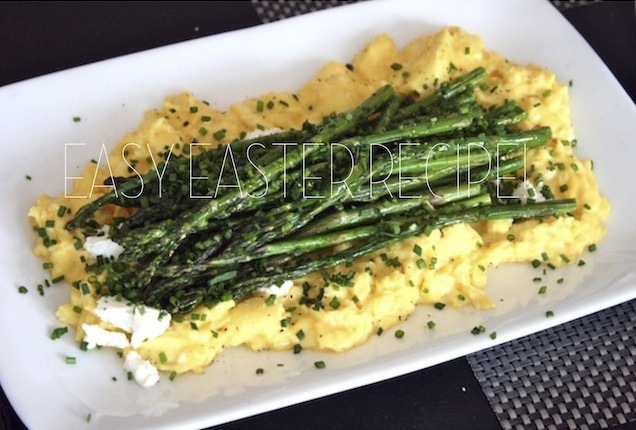 Easy Easter Entertaining: Goat Cheese & Asparagus Scrambled Egg Recipe! 1. Make the asparagus: Preheat oven to 450˚. Spread asparagus in a single layer on a rimmed baking sheet. Drizzle generously with olive oil and sprinkle with salt. Roast about 10 minutes or until asparagus are cooked through and slightly crisp at the tips. 2. Meanwhile, make the eggs: Melt 1 tablespoon butter in a nonstick skillet over medium heat. Whisk the eggs, 1 tablespoon water and 1/4 teaspoon salt in bowl until frothy and combined. Add eggs to the skillet and cook, stirring and folding as eggs set, 3 minutes or until just set. Transfer to platter. Top with crumbled goat cheese, cooked asparagus and snipped chives. Quick note: If you don't care for goat cheese, try swapping in Parmesan.